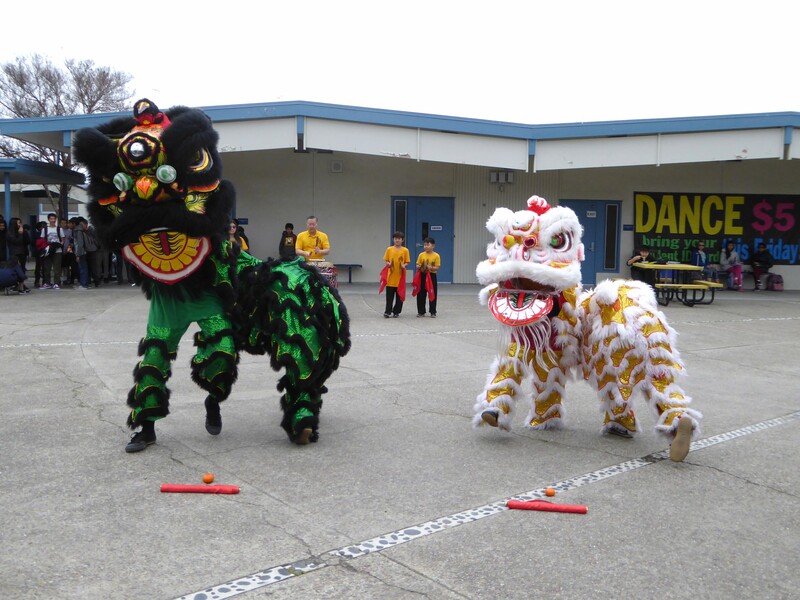 At Joaquin Miller Middle School, San Jose, the gym was a beehive of festivity on Feb. 8 as the school celebrated the Lunar New Year of the Pig with a Chinese fair. The morning celebration was organized by Cupertino Language Immersion Program (CLIP) students, parents and teachers, spearheaded by CLIP instructor Ling-Ling Chern. All 180 sixth, seventh and eighth grade CLIP students showcased their knowledge of Chinese culture and the Mandarin language. They created poster board displays that gave the history of the Chinese dynasties, discoveries, festivals, arts, food and medicine. Classes of students attending the fair tried hands-on activities such as calligraphy and making paper lanterns. The art classes displayed candles with hand-carved designs and miniature hand-made clay pigs, each with a unique personality. 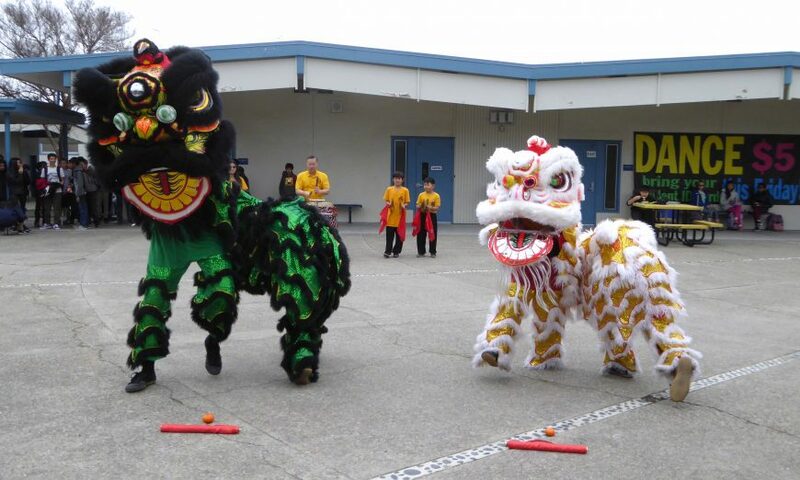 The fair culminated with a potluck lunch and a traditional Lion Dance, led by martial arts and SLKF Lion Dance teacher Stephen Chew. “This is a wonderful event to integrate what the students have learned in their classes and showcase it to other students, staff and parents,” said Chia-Ching Lin, CLIP K-8 coordinator and Meyerholz Elementary School vice-principal. Meyerholz enrolls 430 kindergarten through fifth grade students in CLIP, which began in the Cupertino Union School District (CUSD) 20 years ago in 1999. Meyerholz is the only elementary school in the district to offer Chinese language immersion. 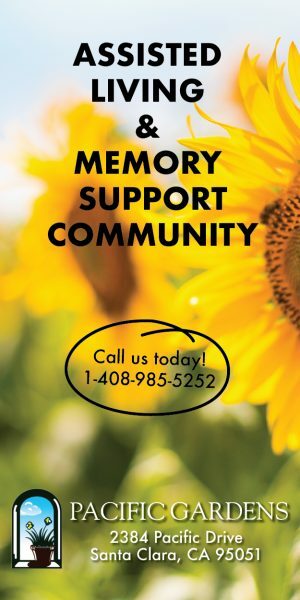 As yet, there are no CUSD high school CLIP programs. CLIP uses a two-way language immersion model with the goal of students becoming bi-literate. At the middle school level, 30 percent (two) of the classes are taught in Mandarin and 70 percent (five) in English. CUSD also covers parts of Santa Clara, Sunnyvale, Los Altos, San Jose and Saratoga. Enrollment in the language immersion program is determined by lottery. “We want to provide CLIP students with a language program in which they are immersed in both the target language and its culture,” said Chern who, along with Richard Kuan and Sheng-Yin Lin, teaches Chinese Language Arts and Social Studies in Chinese at Miller Middle School. Previous Chinese Lunar New Year fairs were organized by Chern at Miller in 2013 and 2014. “We aim to for students in the CLIP program to have proficiency in Mandarin and English, but also to embrace the Chinese culture,” said Miller principal Amy Steele. “It’s awesome. The kids really benefit from the language program and the community becomes more cognizant of other cultures. It brings everybody closer and creates an appreciation of different cultures,” said Tzuping Wei, whose son is a 7th grader in CLIP. CLIPCO (www.cusdclipco.org), the non-profit, all-volunteer fundraising organization that supports the programs in CLIP (www.cusdk8.org), sponsored a Chinese New Year celebration at Miller Middle School on Feb. 9.